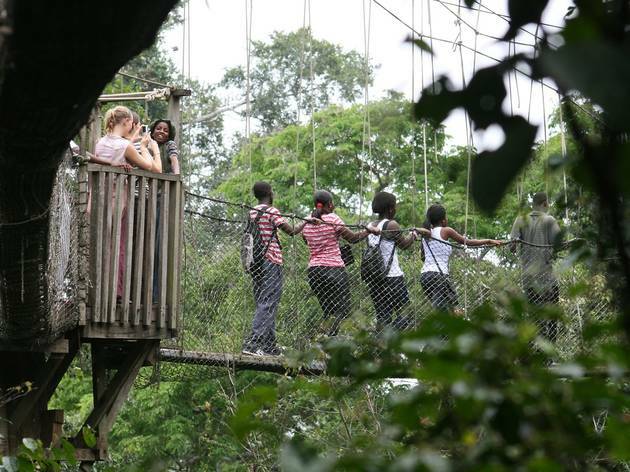 Half an hour’s drive from Cape Coast, Kakum National Park’s verdant slice of semi-deciduous rainforest offers a fresh green alternative to the bustling cities and stifling heat of the coast (033 21 302 265, www.kakumnationalpark.info, 8am-4pm). 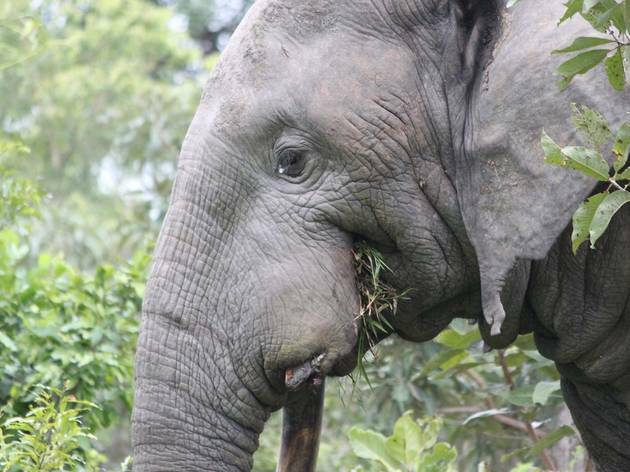 The 607 square kilometres (234 square miles) of protected rainforest are home to an assortment of wild residents, including forest elephants, giant hogs, flying squirrels, leopards and various species of monkey. 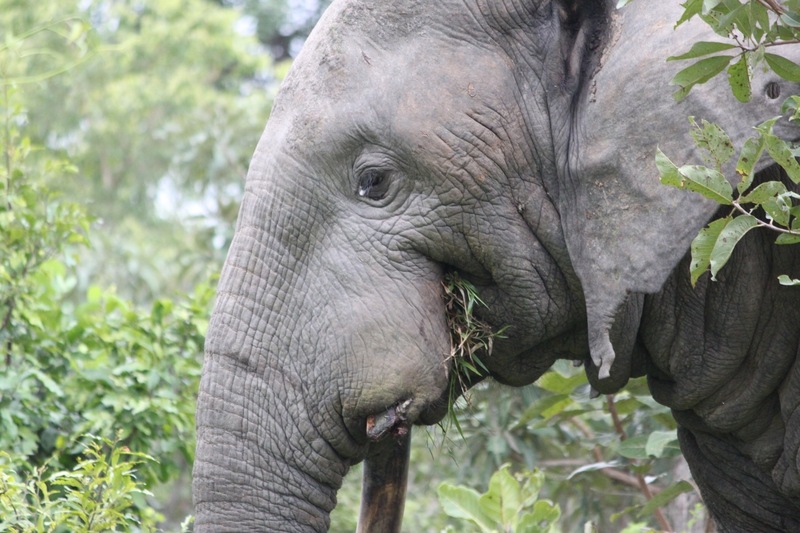 However, with much of the elusive wildlife buried deep in the forest’s flora, there’s little chance of seeing anything more than a millipede or two unless spending a night on an organised camping trip. 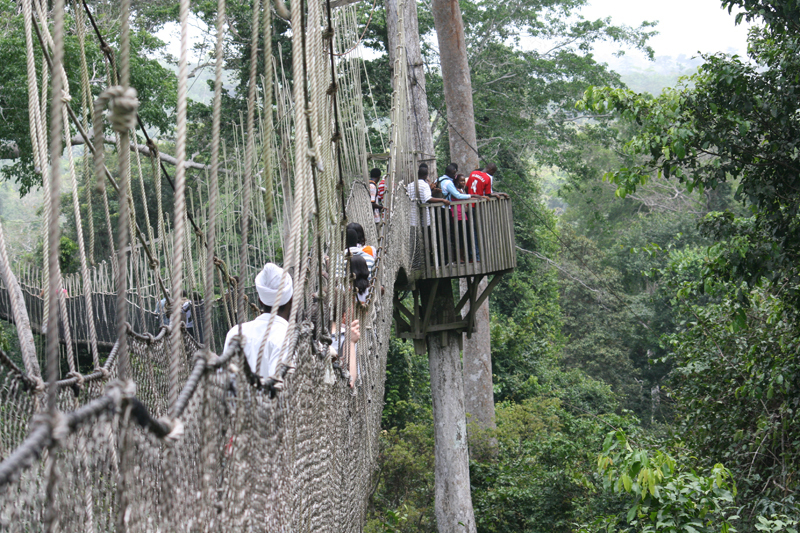 For those content with gazing at the greenery to a soundtrack of birdcalls, try the canopy walk (US$9). 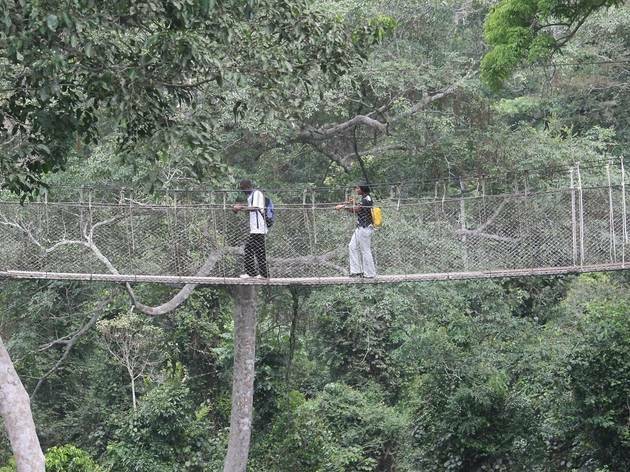 Elevated 40 metres above the forest floor, the 350-metre-long wooden walkway and various viewing platforms offer spectacular, if vertiginous, views of the park, although it is unlikely much wildlife will be seen. 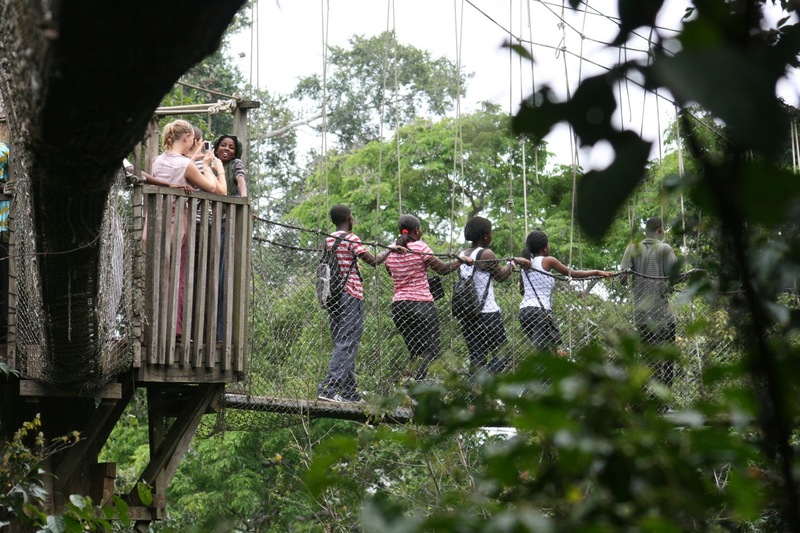 There is a simple but informative visitors’ centre, a café and gift shop administered by the Ghana Heritage Conservation Trust. hose unwinding in Kokrobite can enjoy fresh and tasty meals at Big Milly’s onsite restaurant. The menu includes fresh seafood such as lobster and barracuda, as well as a wide selection of vegetarian options. It’s also open for breakfast. There’s good, basic accommodation here too. Double huts with a fan cost US$22. Single rooms are US$16 a night (US$27 with bathroom and AC), dorm rooms are US$7. Houses are available to rent for groups too. 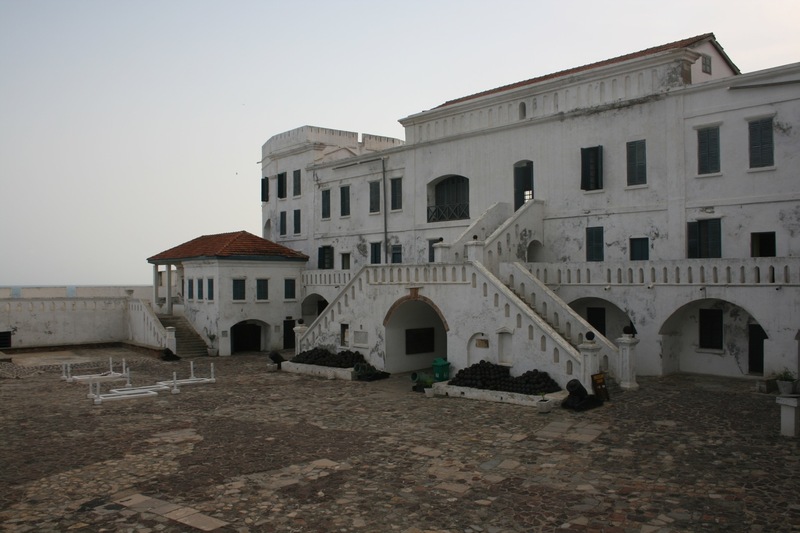 You’ll most likely be aware of Cape Coast Castle already (Barack and Michelle Obama visited in 2009 to much fanfare), as it was here that some of the worst atrocities of the slave trade era were committed. The city was founded by the Portuguese in the 15th century, and the solid white bulk of the castle acted first as a fortified base for overseeing the export of gold and other goods before ‘market forces’ initiated a move into human trafficking. 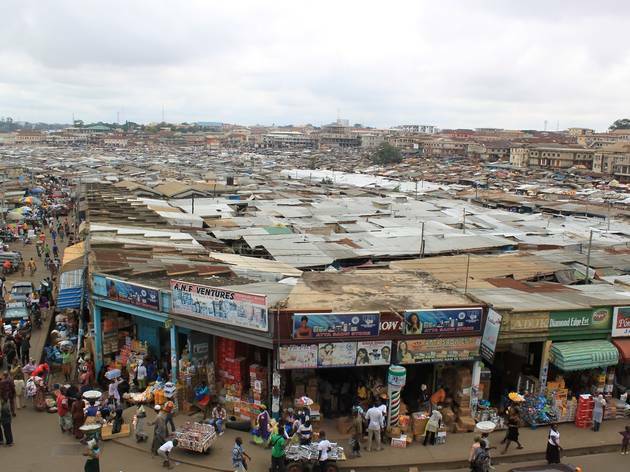 A tour of the site today makes for a harrowing, but undeniably salutary, visit. Thousands upon thousands of West African men and women were imprisoned within the castle’s scratched dungeon walls – in truly horrific conditions – before passing the ‘Door of No Return’ and being shipped off to the Americas, the majority of them not surviving to reach their final destination. To establish a clearer understanding of the crushing reality of the period, the 45-minute guided tour (included in the ticket price) comes highly recommended. There’s also a museum on site. 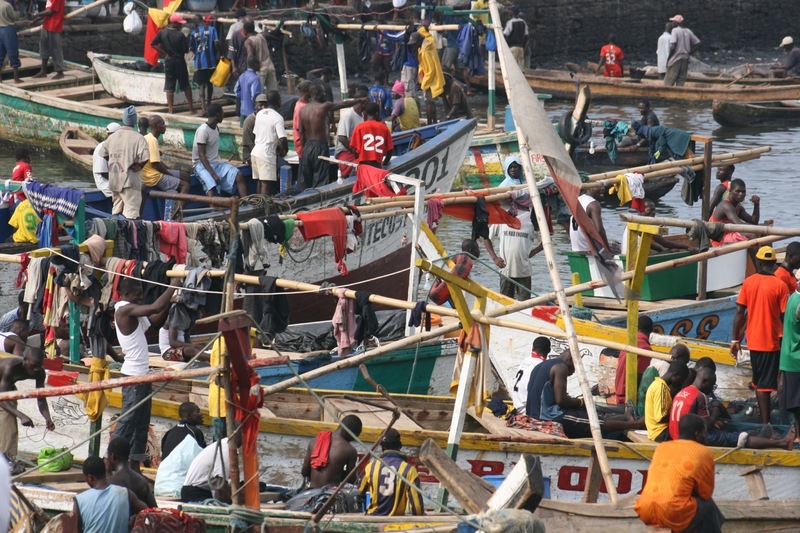 The Castle is now listed as a World Heritage Site, and gazing down today from its old ramparts at the late-afternoon hubbub of fishermen and red-dust footballers, it’s hard not to be stirred by the human cost of its past. 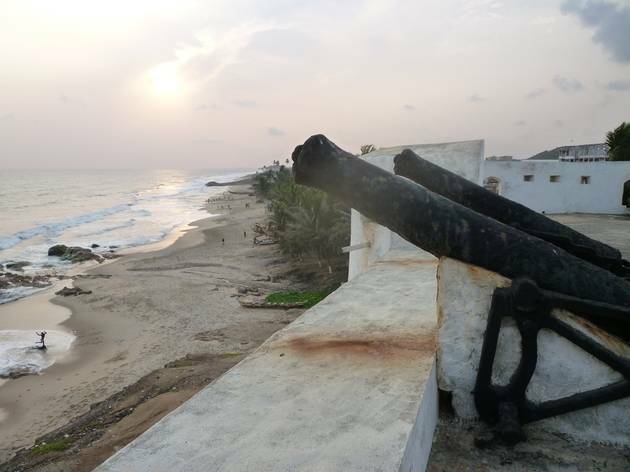 From a historical perspective, Elmina Castle is a key attraction. 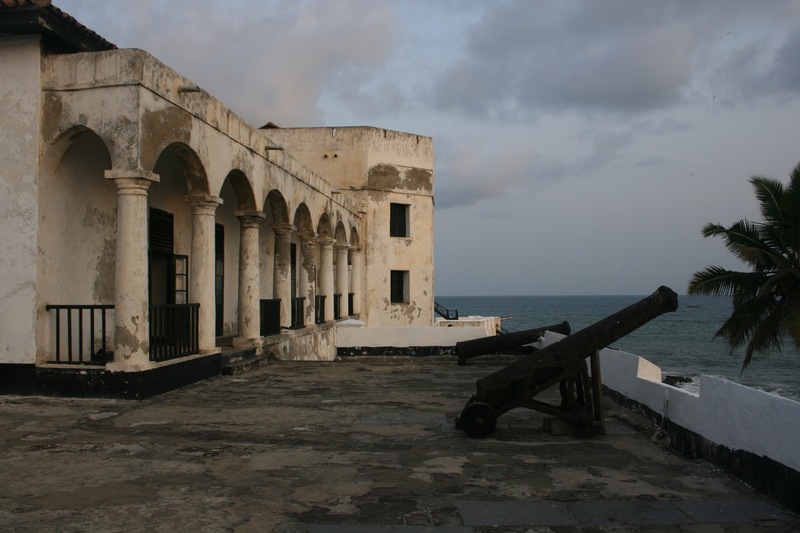 Like its Cape Coast equivalent, it has strong links with the slave years and is registered as a World Heritage Site, although it tops Cape Coast Castle on age; founded in 1482, Elmina Castle (also known as St George’s) is the oldest extant European building in sub-Saharan Africa. It’s had a few facelifts over the years and little resembles the original structure, but still makes for a fascinating (not to mention hugely disquieting) tour. 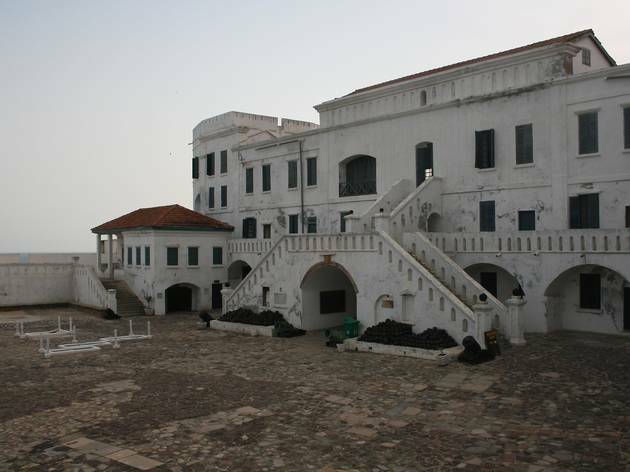 For GH¢8, plus a little extra if you’re taking photos, visitors can explore the dungeons and stairways of the interior (unlike Cape Coast Castle, guides here will ask for a tip of GH¢10). On a more upbeat note, the courtyard adjacent to the castle sees a local group going through drumming and dancing rehearsals each evening from around 5pm to 6pm – a diverting sight if you can make it. British national Brett Davies (aka Mr Brights) has devoted his life to surfing. 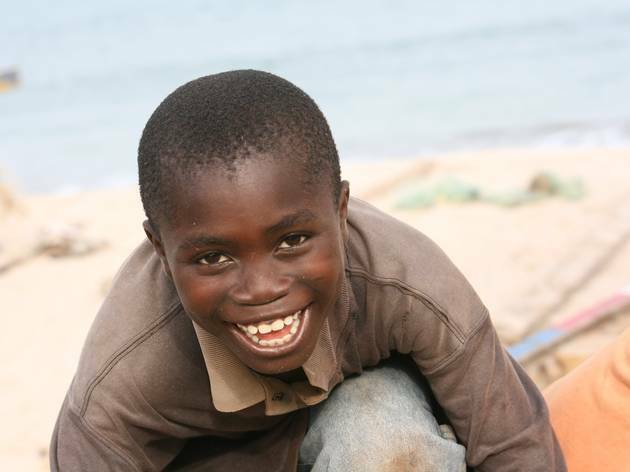 After leaving a top rung job at the head office of Rip Curl several years ago, he decided to take the plunge and open up his own surf school in Ghana (the second love of his life). 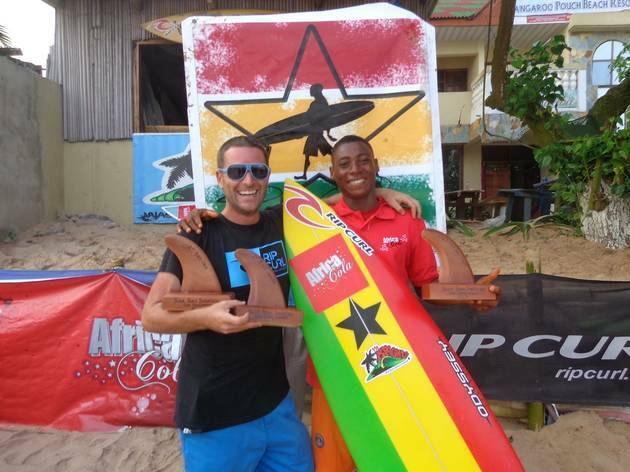 A formally trained surf coach and lifeguard means surfers can’t be in better hands to try out Ghana’s exhilarating waves. Beginners to advanced are welcome, as are children, with boards and equipment naturally provided. The school has been so successful since its inception last year that Mr Brights is opening a second school in Accra at Kokorobite. Bookings are taken via the website with prices given in person. Kangaroo Pouch Beach Resort, Busua Beach (www.mrbrights.com). Open: everyday 6am to 6pm. 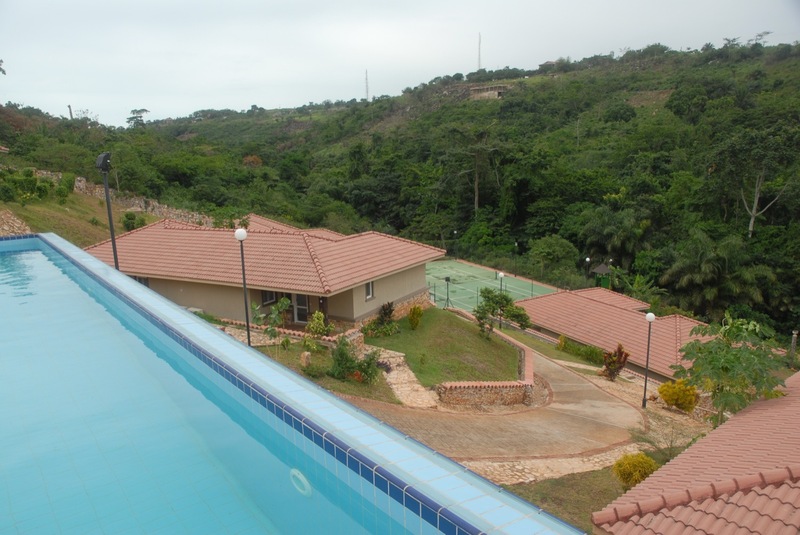 The Royal Senchi Resort is a shiny new four star hotel situated on the west bank of the Volta River. It boasts 84 luxury guest rooms, infinity pool with pool bar, a fitness centre, upscale dining and competent, attentive staff. Rooms are tastefully decorated will all the mod cons, including 32 inch televisions. The conference centre is large and bright, mixing traditional touches with first class professionality. Beauty treatments in the spa include facials, hot stone massages, traditional back massages as well as salon treatments. 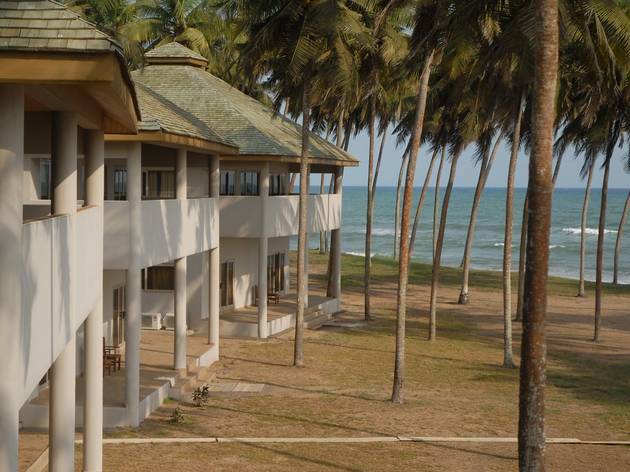 A couple of minutes’ drive farther out of town lies the secluded new Elmina Bay Resort, not to be confused with Elmina Beach Resort. There are 26 rooms available for guests, notable for their cleanliness and bright style. 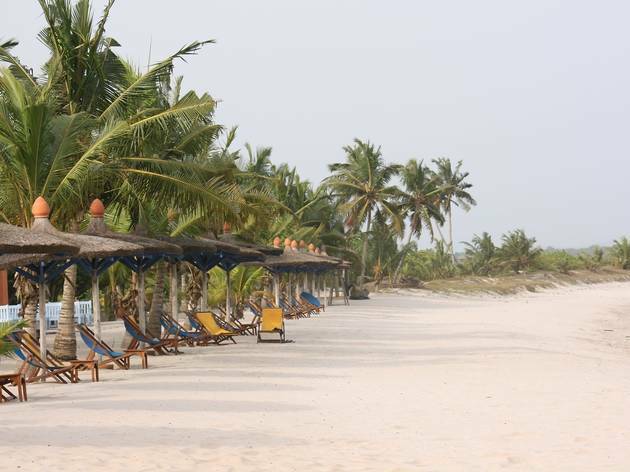 All have sea views, DSTV, Wi-Fi, fridges and air-con, and beach access is excellent. 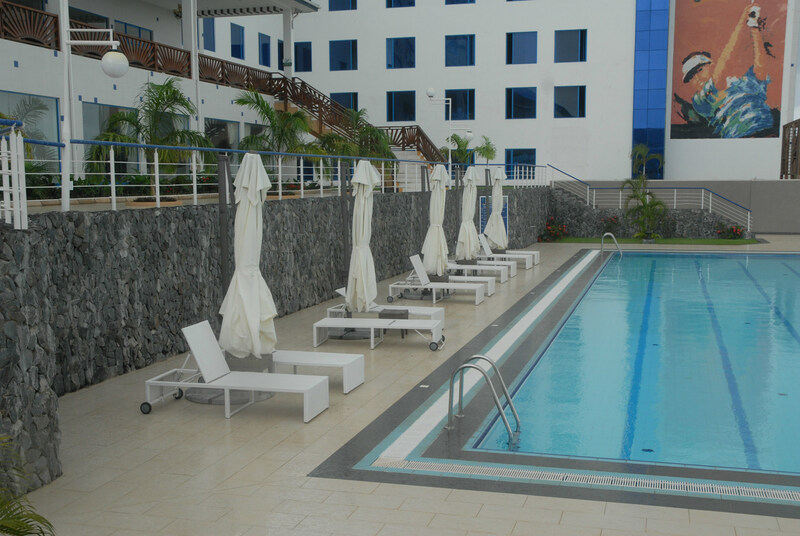 There’s also a pool and a restaurant, making it the best bet around Elmina. 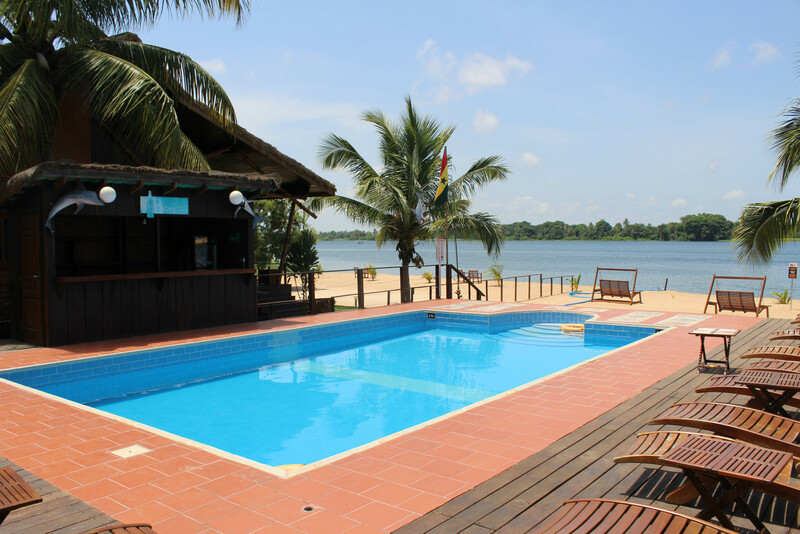 We were rather taken aback by Aqua Safari. 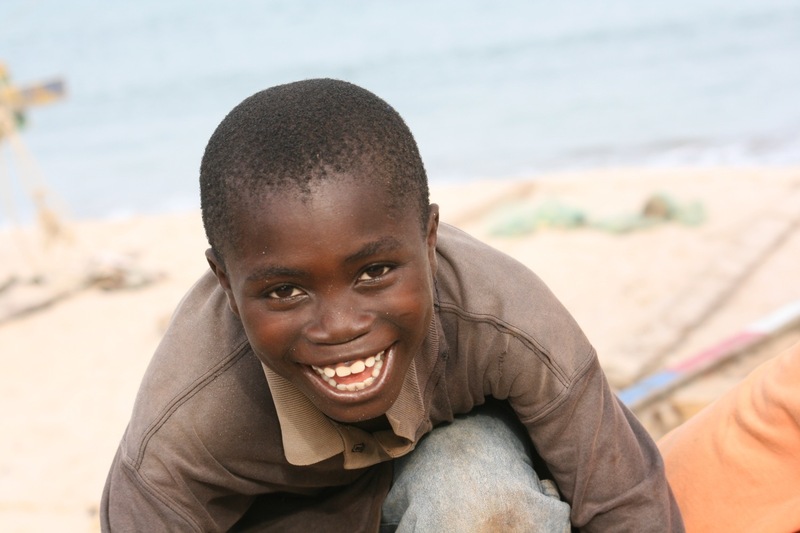 It faces out to the estuary of the River Volta, a mile or so upstream from the ocean. 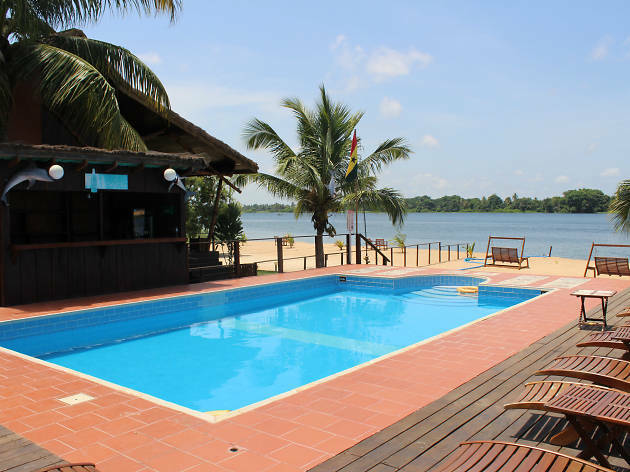 From an open-sided restaurant and bar you can see Ghana’s island-dwelling folk crab-fishing and clam-diving in the water. The forward-thinking owners offer guided tours to the islands for boat-building and basket-weaving workshops – there’s also a lot of water to play around in on a jet-ski or one of the pontoons. Game-fishing excursions can be arranged too. 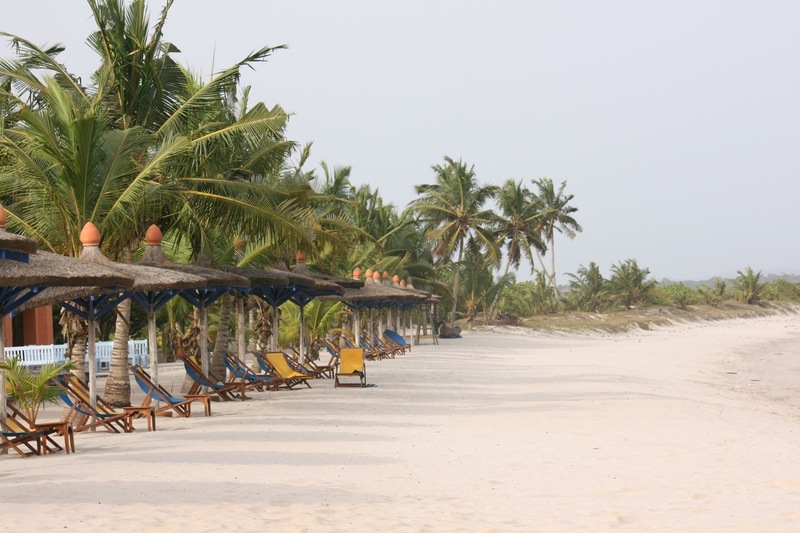 Best of all is the option to spend a lazy couple of hours exploring one of the most beautiful areas of Ghana by boat. 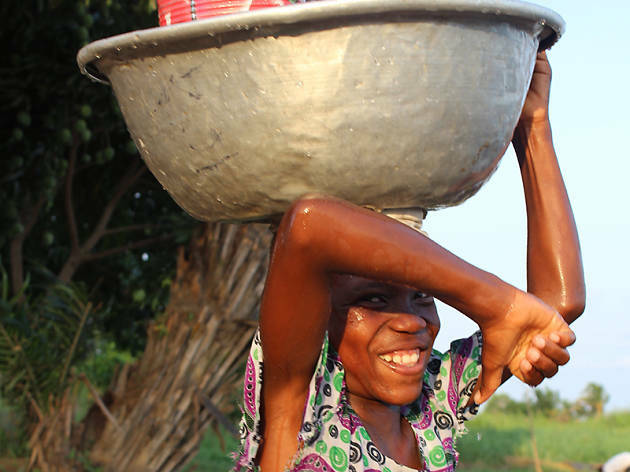 The whole river environment gives a relaxing and slower pace of life; a stark contrast to Accra two hours away. The rooms are well-appointed, and large chalets all have sizable and impressive common areas and kitchens. There’s also a small pool if you don’t fancy a dip in the river. There’s a new, large conference centre with all the modern amenities you’d need. ‘Hidden away’ doesn’t really do justice to the location here. 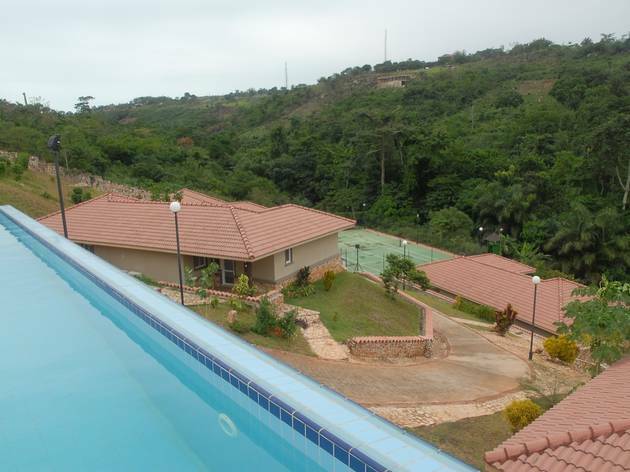 This smart new villa complex in the lush folds of the hills around Aburi isn’t somewhere you’d stumble across – it’s only accessible via a long and winding road, and that’s just how the owners want it. Judging by the Range Rovers lined up outside, it’s pretty exclusive. 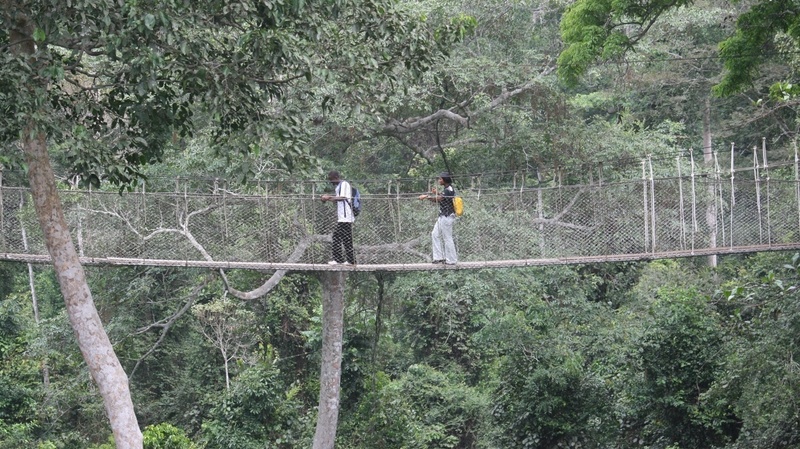 It takes around an hour to reach from Accra (although road improvements mean this time will reduce), but it’s worth the drive. You’ll find eight villas, each with three bedrooms, a living area, jacuzzi and patio – they’re well-appointed and tastefully decorated. 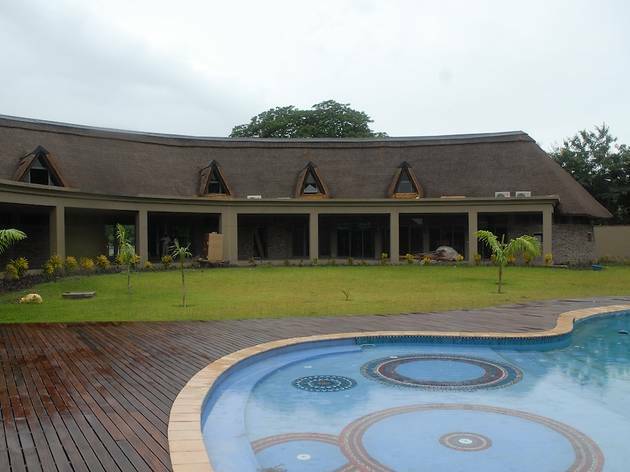 The property also has a conference suite seating around 24 (corporate groups being one of the main income streams here), and a gorgeous pool overlooking the valley. 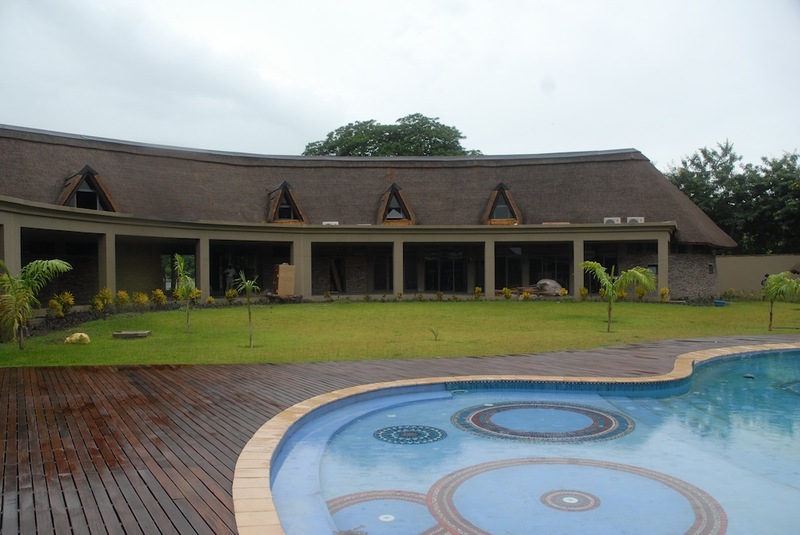 The open club house and restaurant above the pool are lovely spots to watch the clouds roll out in the morning, or listen to the sounds of the bush in the evening. It’s all built on a hill, so you’ll be working off the food from a menu that includes lamb tagine, T-bone steak, paella and traditional Ghanaian food. There’s a spa and a tennis court too. 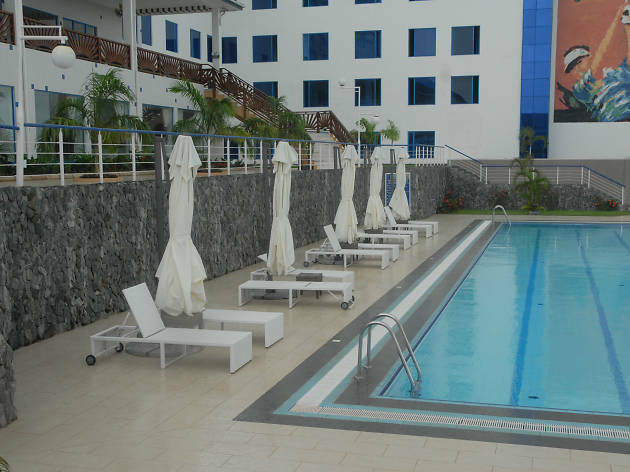 There’s no missing the 100-room Atlantic Hotel, a huge white monolith overlooking the ocean around Takoradi. The rooms in the main building are modern and well-appointed – ask for one with ocean views. There are also 12 chalets, with single and family rooms among the leafy paths. The highlight, however, is the pool area – a ridiculously inviting sight on a hot day. Combine it with a seafood platter from the outdoor Canoe Bar and you have the makings of a lovely afternoon. 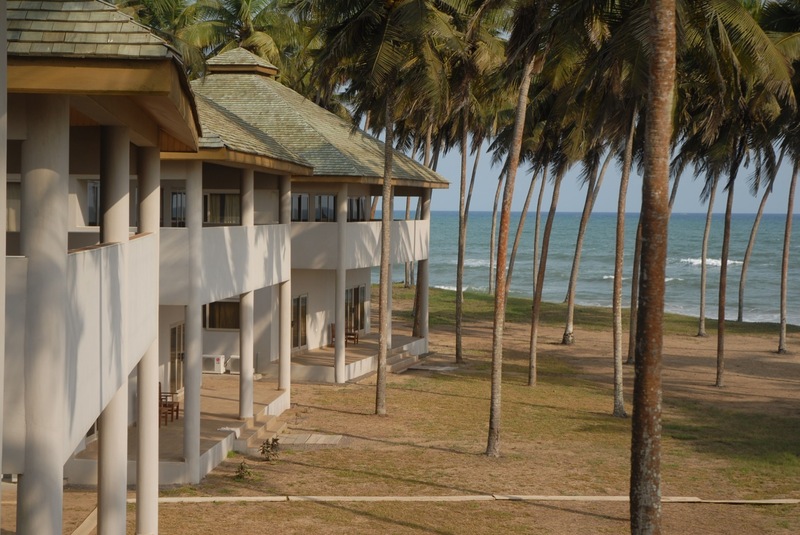 The main Ocean View Restaurant & Bar offers a large buffet with the chance to try some flavourful Ghanaian cuisine. 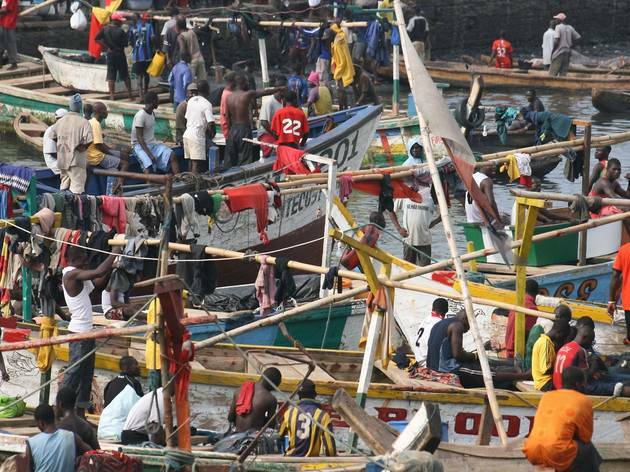 Like much in Takoradi, the hotel will cater mainly for the many oil workers who pass through the town – you can see one of the rigs being built in the Bay of Guinea from the terrace. There’s a vast conference and event suite, plus a smaller function space. A private golf course sits in front of the hotel. 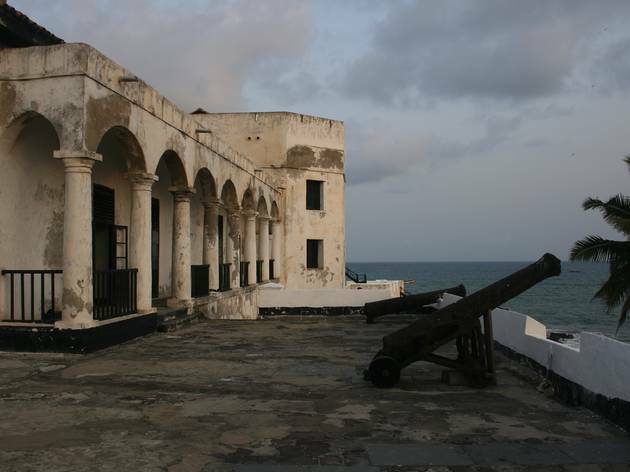 Ghana's old capital city Cape Coast and its imposing castle is a window into the country's history. 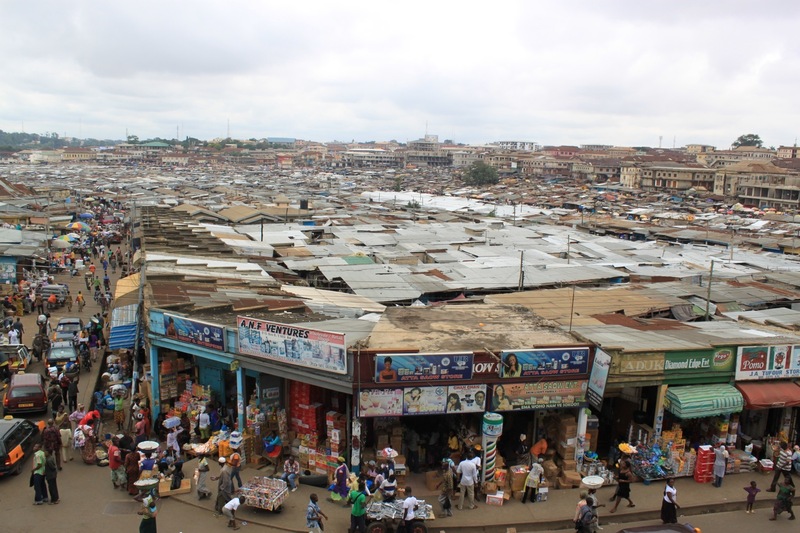 Ghana's second city is a sensory overload – drop in on Kejetia Market, West Africa's biggest of its kind. 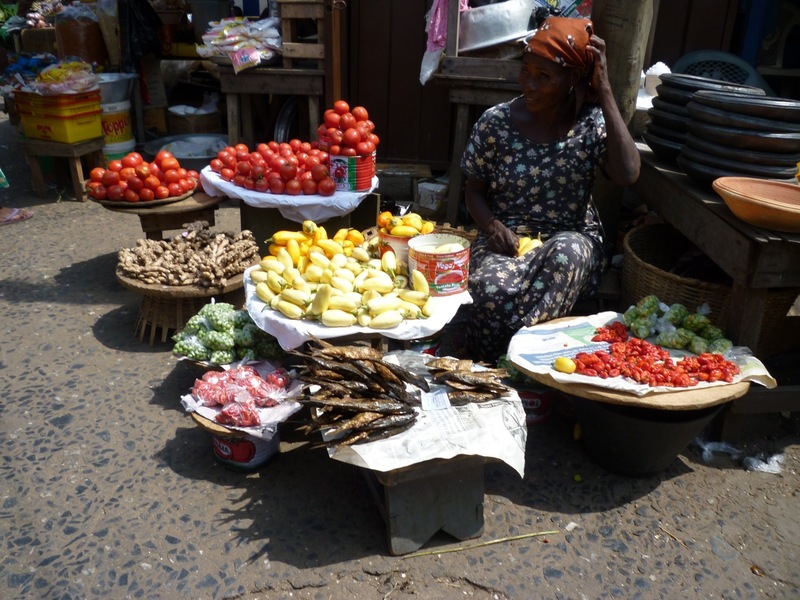 Experience Ghanaian life in full colour in Takoradi-Sekondi, aka Tadi, aka the Twin City. 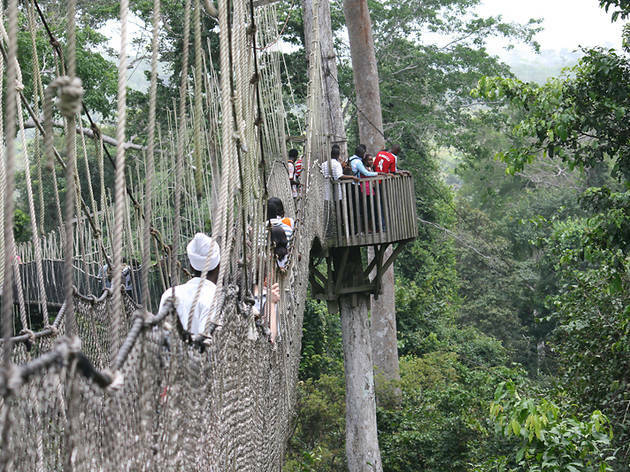 This verdant slice of rainforest is a fresh alternative to the bustling cities of the coast.